I have replaced all the suspension parts that were worn and also upgraded to some Bilstein B6 struts all round. I had my geometry re-set this morning and the guy mentioned he'd run out of adjustment on the rear to get it to X74 spec. I've had it mentioned before that it won't adjust all the way but it does handle pretty good in its current setting but I assume it will be better if I can get it correct. I'm think it was more negative camber he was trying get? I would get down to CG but I know how booked up they get and it's something I want sorting ASAP. I know the X74 is -30mm lower than standard but I assumed this was just down to shocks and springs, are there other parts that were different that will allow me to get the exact X74 set up I'm after? I may be disappointed once it does but I would like to try and I may save going through two sets of rear tyres a year. If it helps Chris, I had the same problem when I fitted B6's and lowered springs. Despite my best efforts I could net get enough toe adjustment as well. The camber was not the biggest issue for me as it was not massively out - I ended up making some adjustable toe arms to sort the issue out. I'll have a read of your thread Chris when I get a minute. I've had a read through your thread and now I'm wondering if the cost difference was worth making your own unless the Motorsport parts weren't too eye watering. There are sets available including the chamfered outer end stud for around £400, obviously I would rather have the same results for less cost. I had the car on track at Croft yesterday (with crap set up) and it felt good but I still would like to be able to adjust it to correct spec. 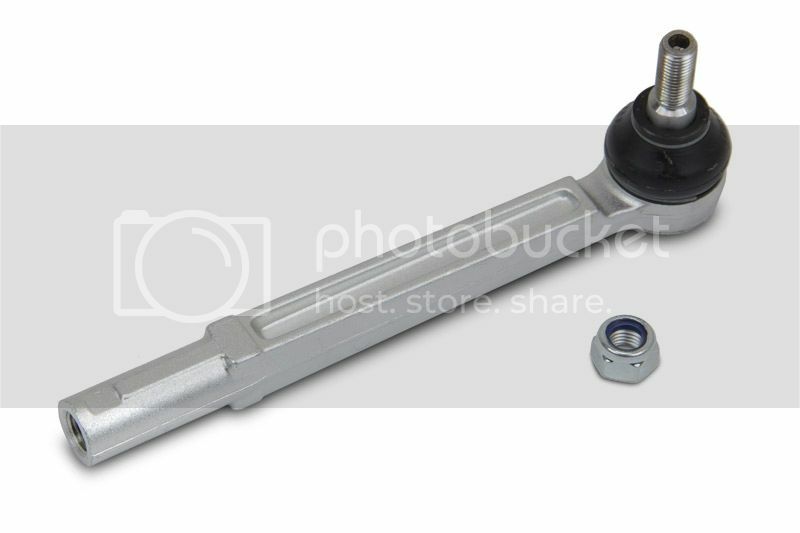 Anyway I've just started thinking out the box and wondered if the chamfer for the front track rod end ball joint of the steering rack are the same as the toe arm outer, if so this would be easy to have the inner end made up with a threaded bar and rose joint. I nearly went that route but didn't - cant for the life of me remember why?. I found these while researching, I'm just not sure what thread I'll need? I assumed McGill MS would have sold them but there was nothing on their website. The track rod ends are M14 x 1.5. I've just ordered a track rod end to see what I can make of it, then a rod with a LH/RH thread and a rose jointed end, I'm hoping for some kind of success. I will ask McGill later this week as I will be going to see them about some parts anyway. Cool, although I've had a look on their site they don't seem to do male threaded Jackscrews and the only ones I can find online are not metric threads only UNF. Mmmm not sure if I have hit a dead end like Chris had, although I'm thinking of getting some made up. I'm sure this is something that Alex could make. I've got a spare toe arm on the bench and I'll wait until the track rod arrives then take some measurements for length. Rose jointed ends wear quickly do they not? Fine for limited mileage/smooth track work but on road cars maybe not the best application. If you get decent teflon lined one's they last pretty well - they are fairly cheap to replace TBH. Just been having a look myself Chris. There may be some 'off the shelf' ones you can get which will obviously be cheaper than me making some custom made ones for you. Not a problem if you need me to though and I should have them turned round and down with you within a few days. Might struggle getting them in the UK though. When I started to try and sort this, one other issue I had was getting a short enough 'turnbuckle' to connect the track rod end to the rose joint McG Motorsport only have a 165mm as their shortest one and I seem to remember that adding this to the rod length and rose joint plus a couple of half nuts was too long. Maybe I didn't look hard enough but it was frustrating to the point I bought the motorsport parts. I'm going to get Alex to machine up the exact size LH/RH rods I need to sit between the track arm and rose joint so in theory it should all work out fine. What misalignment spacers did you buy from McG to fill the gap, I'm just looking at them online but I'm 140 miles away from the car/garage to be able measure the current bush? The M14 ones say they are 11.1mm wide, were two on each rose joint enough? Hi Chris, I ended up using the 14mm to 12mm reducer in each side of the joint from McGill. The bolt at the chassis end is m12 so it needs a sleeve. This does not leave a huge amount of room so I used 2 m12 stainless washers - one on each side. When it's all tightened up it works a treat. For the sleeve, did you just use 14mm OD to 12mm ID tubing? I'll order all the McGill stuff today. They also act as a misalignment spacer as well.